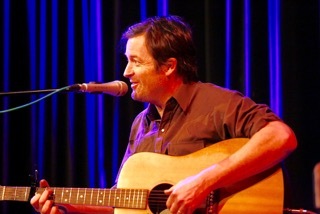 Willy Vlautlin of the band Richmond Fontaine and The Delines graced the venue with an evening of words and music; sat with his acoustic guitar and sideman, David Murphy (pedal steel) the audience enjoyed a terrific show. Packed to the gills with anticipation was running high the boys strolled out on stage. Vlautlin with a copy of his new book Don’t Skip Out On Me sat on the table in front of him. Murphy’s accompaniment immediately proved to be a vital ingredient when it came to highlighting the various moods of Vlautlin’s work. Whether it was tender purring, or sharper west coast country rock hinted he was the business. With Vlautlin’s vocals vying towards a present day Gram Parsons the music couldn’t have been more enjoyable. Vlautlin’s storytelling in both the songs and passages read from his latest book which comes with an instrumental CD (one of two of the tunes which they performed) were of a quality the attention of the audience never wandered one iota. An interview about his writing even took place on stage, and though long enough no one minded. Held snug in the palm of his hand, they lapped up the story of the relationship between ranch owners Mr & Mrs Reese and young ranch hand, Horace Hooper who became like a son to them. Horace had his heart set on becoming a champion boxer (for more you will have to purchase the book). Having lived and seen much of America’s North west coast the founder member of Portland, Oregon’s Richmond Fontaine hit the spot. Some of the songs showed sides of his past. The seed was sown back when he was growing up (he was into writing songs and stories by his teens), living the life of a struggling writer, pretty much hand to mouth. While Vlaultin might not often write songs rich in flowing melodies or hooky ones either, but his descriptive style as found in his six novels; Motel Life, Northline, Lean on Pete, The Free and the above mentioned Don’t Skip Out On Me ensure the listener is given something to cling onto as rich imagery is prompted. Filtering his emotions, the pieces read were riveting. Vlautlin has a creative eye, a natural when it comes to describing the landscape and life of those less fortunate. His ability to lure the listener into his material is down to the honesty and honing of his craft. With an affinity to working people and those of a rural upbringing in particular you had the likes of “Whitney And Me” and with a distinctive Gram Parsons feel, “Colfax Avenue” lifted the benchmark another level. Vlaultin also spoke of how his book Motel Life has been made into a film and to top it all, was filmed in his hometown. Not many people could have put on a show like this, and delivered it in such an entertaining and caring manner; as done by Vlautlin and pedal steel wizard Murphy.